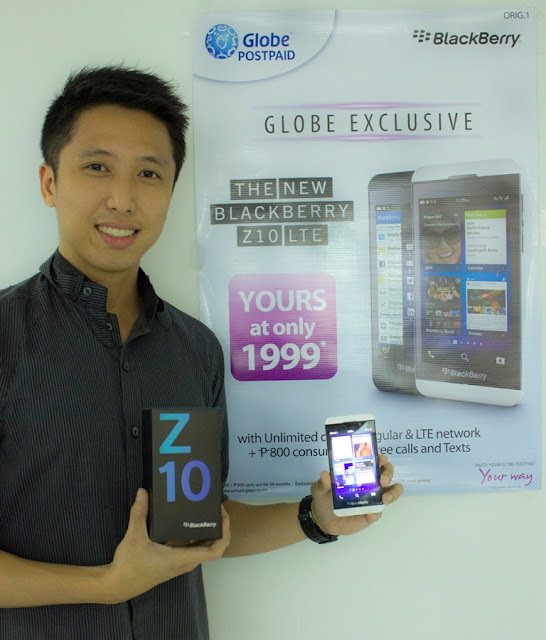 Globe Telecom recently launched the new BlackBerry Z10 and scored exclusivity to offer the BlackBerry Z10 LTE version in the country under its fully-customizable unlimited surfing plans bundled with unlimited browsing, consumable amount for calls and texts, and freebies. Subscribers can get the BlackBerry Z10 for free for as low as P1999 monthly at Globe Unli Surf Plan 1799 with P200 monthly cashout over a 24-month contract. With Globe Unli Surf Plan 1799, subscribers get unlimited and worry-free mobile surfing, P800 monthly consumable amount for calls and texts, and three (3) call and text freebies. The device is also available for free at Globe Unli Surf Plan 1799 over a 30-month contract. Interested subscribers can order the BlackBerry Z10 from Globe at www.globe.com.ph/bbz10. In photo is Globe Marketing Manager for Devices and Subsidy Teolo Reyes.